Soft buttery and cheesy, these low carb, gluten free, Keto Pull Apart Clover Rolls are unbelievable good! The recipe includes video directions above. Keto Pull Apart Clover Rolls are the best low carb gluten free rolls that I have ever made! 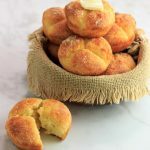 Soft, buttery, cheesy rolls that pull apart into three sections like a three leaf clover and they are low carb and gluten-free! Watch the Video above the post to make these with me. I had a request from a very wonderful, long time viewer named Kelly. She asked for me to make a low carb version of cloverleaf rolls. 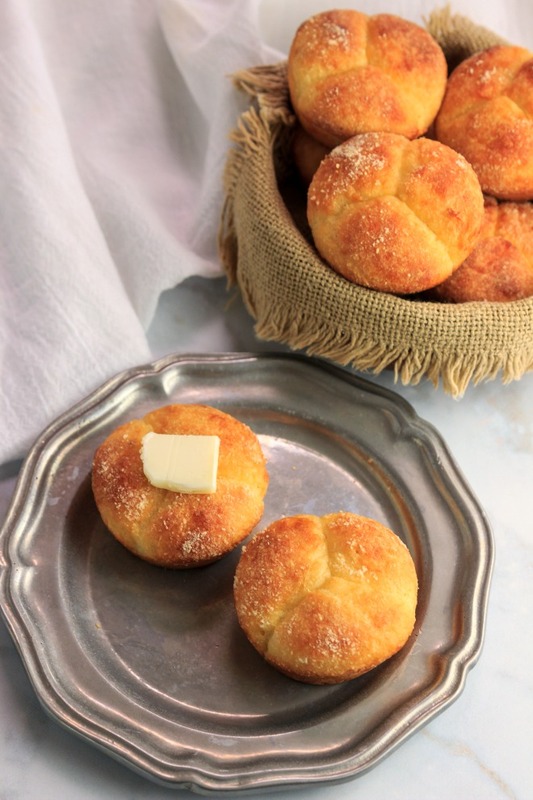 So, I did a low carb make-over on an old-school recipe for traditional cloverleaf rolls and made them with almond flour instead of traditional flour. These are yeast free and grain free but not dairy free. Thank you so much, Kelly, for the brilliant idea. I really appreciate your comments, ideas, requests, and continuous support. These turned out so darn delicious that I made a second batch and also because my hubby and son ate almost all the first batch by themselves. Even my hubby was in shock at how addictive these are, and almost ate the whole batch himself! 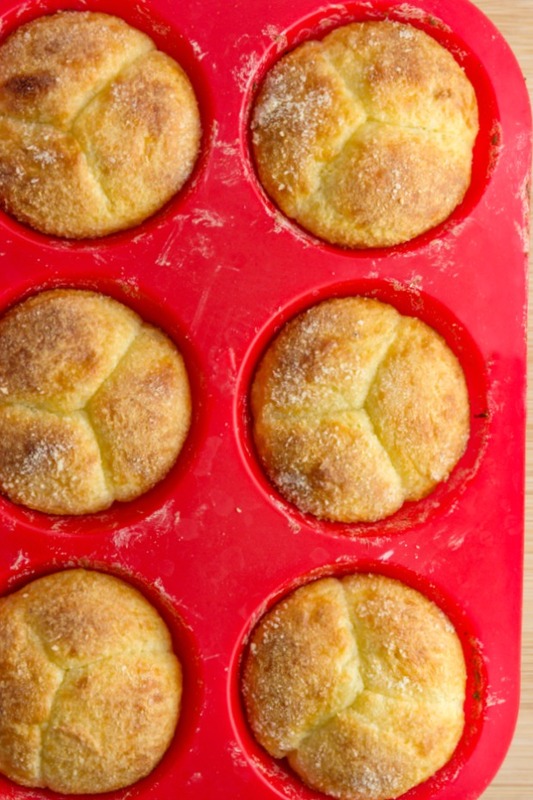 He said that these are way better than conventional store-bought high carb rolls! Grease or spray with non-stick oil spray a muffin pan and preheat oven to 350 F.
In a mixing bowl combine the almond flour and the baking powder, mix well. Set aside. Melt the shredded Mozzarella and the cream cheese on the stove top (or in the microwave for 1 minute) until melted. Once the cheese has melted, add flour mix, and eggs. Mix together. Grease hands and knead dough to form a sticky ball. Place the dough ball on a large sheet of baking paper or a silicon mat. Slice the dough ball into fourths. Then slice each quarter into 6 small pieces. 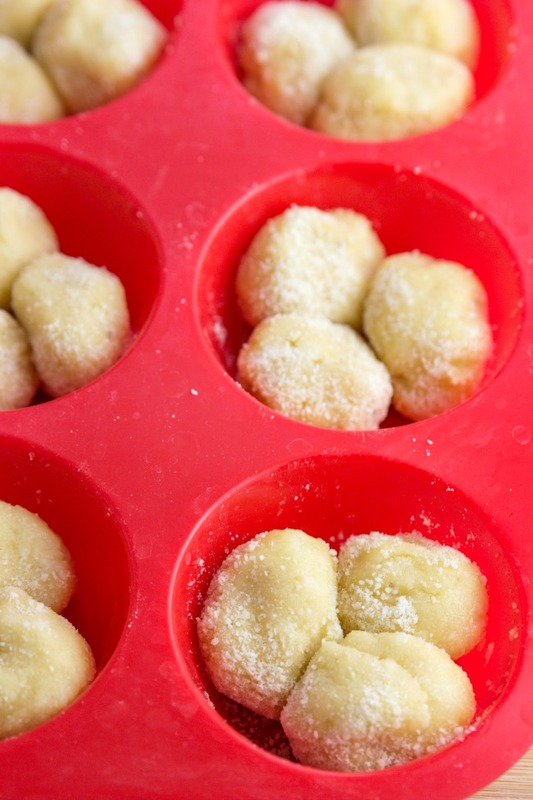 Roll the small pieces into balls, and lightly roll the balls in a bowl of the Parmesan cheese to lightly coat them with Parmesan (this helps them be able to pull apart easily). Add 3 of the dough balls to each muffin cup in the muffin pan (this makes the 3 leaf clover). Bake at 350 F for 20 minutes or until golden brown. Remove from oven and allow to cool slightly before serving. Nutritional Data: Yield: 8 rolls, Servings:8, Serving Size: 1 Roll, Amounts Per Serving- Cal: 283, Carbs: 6g, Net Carbs: 4g, Fiber: 2g, Fat: 21g, Saturated Fat: 8g, Protein: 16g, Sugars: 1g. Keto Pull Apart Clover Rolls are the best low carb gluten free rolls that I have ever made! 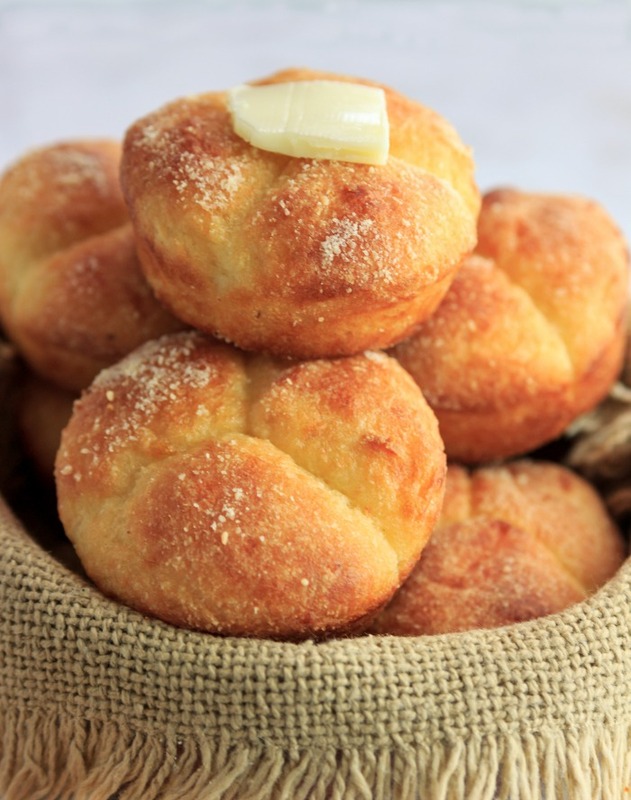 Soft, buttery, cheesy rolls that pull apart into three sections like a three leaf clover. Fara, you can you either of those. I loved your recipe. It reminded me of a cheese nip.. so I altered the recipe using cheddar and a rolling pin. I still baked them at 350, and poked hole with them with a fork on both sides. I poked them in between cooking, because they did need to be flipped half through. And oh dear, they are good. Hello Stacy, I am a newbie to OMAD and Keto and started 3 weeks back. 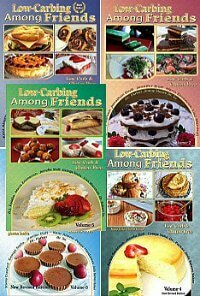 I have been researching all over for recipes for perfect macros. Tried your recipe last night and OMG, it’s beyond words awesome:). I added minced garlic and chili flakes in it, used almond flour. This morning once toasted it tasted like cheese and garlic pizza. Hahaha. Thank you so much for sharing this as I can see it becoming base for tons of different variations. Thank you so much, Ritu, I so glad you’re enjoying the recipe. I think it would make an excellent pizza crust too! Ritu, not yet, but on my list to try. I have been craving some buns for months now, so i decided to try this. I did use 1/2 cup of almond flour and the rest is hazelnut flour. I used 1 egg and a whıte. I am waiting to have some but so far the best i have had. Just tried these tonight…. yummy! And so easy! These were fabulous. My first time making any type of keto friendly roll and will absolutely make them again. I failed to see to add the grated cheese whoops! I also added larger flake seasalt on the top of each roll. Thank you for trying them, Corinne and for your very kind words. The sea salt flakes would be so good on top! I made into a loaf and added cheddar cheese…not on any diet so I’m not sure that’s an option but wow crazy good.. Thank you, Dianne, such a great idea! I was hoping to bake it as a loaf also. Did you have to modify cooking time? I just made these and OMG!!! Best biscuits/rolls I have ever tasted. I made a double recipe and used 1 1/3 cup almond flour and the 1/3 cup coconut flour both in mine and cheddar cheese rather than mozzarella. LOVE IT!!! Thank you!!!! Bestest Keri Rills🏆. Thanks for the recipe. maybe just almond flour would work but I’m not sure. I definitely think you could just roll them in a little almond flour! A lot of restaurant breads have a dusting of cornmeal on the outside, and I think it would be fine to try it out! Made these tonight. Delicious! Thank you for sharing! Hi Vanessa, I stored mine in the fridge for almost a week (6 days) and they were fine. 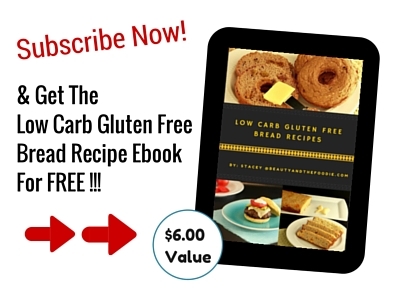 I’ve been low carb for many years and have tried many, many bread/roll recipes. This was absolutely the very best one I have tried. My husband would appreciate me making them many times per week! Do you think it would be ok to double the recipe or just make it twice? We love them. I have some Evrything But Bagel seasoning and I’m going to try sprinkling some on my next batch. Will let you know how it tastes. Thank you again for your marvelous recipe. Thank you, Nancy, for trying the recipe and your kind words. 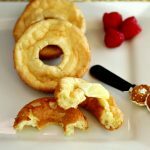 My hubby (not low carb) said I can make these anytime for him! Yes, you could double the recipe. I saw that bagel spice and I really want to give it try too! These were pretty good, maybe a little bit on the dry side, but still good. These are the BOMB. I’ve tried so many keto rolls and these are the only ones I’ve made more than once. I always add 1/2tsp salt and 1/2tsp garlic powder to the dough to amp it up. I have also skipped the muffin pan and simply put the three dough ball clusters together on parchment paper and they bake up great -and no pan to wash! Make these right now! Thank you so much, Jules, for trying the recipe and your very kind words! Wow, I’m trying your “no pan” technique! Marccee, I have not tried it, but one my viewers did and said it turned out great with cheddar. Can you make the dough in advance and store in the fridge and cook the following day? 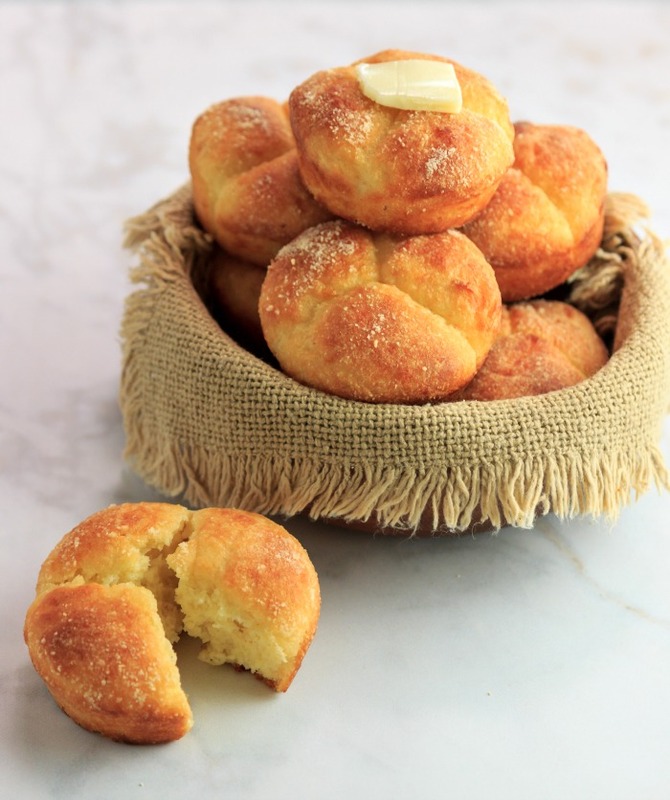 Hi- I am making these for thanksgiving tomorrow- do you know if I can prep them today and bake them tomorrow? Or will they not rise as well if I do that? I would rather serve them hot from the oven but I would love to prep this today and just pop them into the oven at the end of the meal prep tomorrow. Thanks for a a great recipe and Happy Thanksgiving to you and your family! I have not tried that yet but I have baked in advance and reheated them in the oven the next day. Just made and they are super yummy. I must not have the best ingredients though because mine still came out to 5 carbs each. 🙁 I’m thinking maybe I need to grate my own cheese? Thanks for the recipe! I have non-blanched almond flour. Will it still come outas delicious? Yes, just darker, a bit denser and may not rise as fluffy. I made them tonight with unblanched and the were delicious. Now I haven’t tried them with blanched but have tried them with the coconut flour and I didn’t like them with the coconut flour.. Happy Thanksgiving! I did them just now with coconut flour do to a nut allergy. Just wondering why we use significantly less coconut flour than almond flour? Amy, Coconut flour seems to be denser and concentrated than any flour I’ve ever used. You don’t need nearly as much. Amy – thank you for posting that question. I was having trouble understanding if it was supposed to be 1/3 coconut in place of the 1 1/3 almond. Just seemed odd to me but Stacey cleared it up. I haven’t made these yet but plan to soon. I have not tried it, but I’m thinking it is possible to add some yeast to it. You could try adding some nutritional yeast flakes. These were delicious! I made them last Sunday as part of our keto meal prep and they kept very well in the fridge for the all week. Thank you for the recipe! Thank you so much, Sasha, for trying the recipe and for taking the time to leave a kind comment 🙂 I appreciate it so much! Love this! Can I use a loaf pan instead? I WANT A SLICE OF BREAD!!! Thank you, Susan, Yes I would think you could use a loaf pan as well to make bread. Cooking time may need small adjustments. Thank you, Caroline, for trying the recipe and sharing your chili garlic addition with us. Sounds delish! 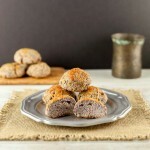 Hi..can I use chickpea flour instead of almond or coconut flour? Hi Debbie, I’ve never used chickpea flour before. Does it rise in baked goods? Is there a substitute for the cream cheese? Even in baking it’s too much for my tummy. Hi Valerie, it might work without the cream cheese, but I haven’t tried it yet so I’m not sure. Let me know if you try it. I haven’t tried it, but I’m thinking you could use a 1/3 cup coconut flour in place of the almond flour and it could potentially need 1 more egg, but not sure. Let me know if you try it. Thank you so much Joyce, will add that option. So if you use almond flour it’s 1 1/3 cups but if you sub with coconut flour it’s only 1/3 cup? Yes. Coconut flour is very concentrated, you don’t need much. Morgan, coconut flour is heavy, so I can see that happening. How many were you make using the coconut flour? Do you think they could be made in advance and frozen or would that make them lose their fluffy texture. I am trying to make Keto friendly Thanksgiving as well as a traditional meal for my parents who want everything like it has always been. I am an only child so it’s on me! Anita, I’m not sure about freezing them. I have made them in advance and refrigerated them for about 5 days. Did you bake them and keep in the fridge or keep in the fridge and bake right before eating? I just made them and my husband said they are a keeper! I’ll double the recipe for Thanksgiving, but would rather bake them right before dinner. I baked them, stored in the fridge, and warmed them right before serving. How did you warm them up after refrigerating them? I put them in the oven on warm (175F) for a few minutes. Oh my goodness these look so fluffy and so perfect for all the holidays coming up! What do you grease your hands with. My dough was so sticky it was hard to work with. Stacy, Mine was sticky too, but it still works. I used olive oil on my hands. But still had a little stickiness. Just made these with sweet seasonings instead of parm – I tried Flavor God chocolate donut, FG gingerbread cookie, cinnamon and erythritol and another with just erythritol… I made each one with four balls instead of three so we could each taste them and give our votes (they were a little dry – this May have been why?). Gingerbread and cinnamon were the favorites. I’d like to try it again with all cinnamon and some butter to make money bread! 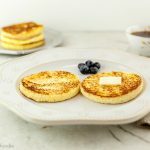 Thanks for this recipe – I’m sure I’ll be referencing it often (we’re only two weeks in to this keto adventure)! Thank you, Aimee, for sharing your great ideas and your kind words. These tasted wonderful BUT the calories, fat and protein make them way to much to eat often. Stupid me I had 2 with my breakfast. Now I have very little I can eat for the rest of the day. My husband wants me to make them into bread for sandwiches. Not gonna happen. Cindy, these are higher in healthy fats for the keto diet, which is a high-fat, moderate protein, low carb diet. I’m with you there, Cindy. Keto does not have to be high fat (unless you’re doing it for medical reasons), especially if you have fat on your body to lose. I may try making these with Neufchâtel instead of cream cheese, part skim mozzarella, and 1 egg + 1 egg white, or some combination of the three substitutions. I think the mozzarella is needed to make the dough have stretchy quality. I just made them with cheddar and they turned out really good. They taste just like cheesy bread. Thank you, Katie, for trying them and sharing the tip for using cheddar. I will use cheddar the next time I make them! I’m in tropical country, may I know how best should I keep the rolls . I’m the only one keto in the house… and love bread..
Mae, they should be refrigerated to store them and reheated when needed. Hi there I am trying low carb (not keto) and moderate fat. Do you think it’s OK to sub half of Almond flour with regular plain flour? Am wondering if almond flour and regular plain flour is interchangeable. Thanks a ton! HOH, I’m sure you could swap 1/2 the almond flour for regular flour. They would be higher in carbs but lower in fat, if that is what you are trying for. OMG! These rolls look so good and they are so cute, too! These rolls were easy to make a tasty! I served them with a meatball Casserole Parmesan – low carb keto and the meal was a success! Even had leftovers! Thank you, Sandy, for giving the recipe a try and also for your kind feedback. Dang Stacey these look perfect for the holidays! I wish I could reach through the screen and just take one, lol. 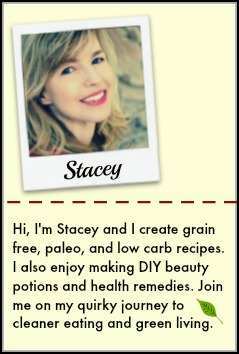 THANK YOU STACY FOR CREATING THIS RECIPE!, I CAN NOT WAIT TO MAKE THIS!, YOU ALWAYS HAVE SUCH WONDERFUL RECIPES!. 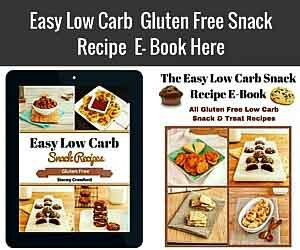 I’M TRYING AGAIN TO LOSE WEIGHT & GET HEALTHY AND WITH YOUR GREAT RECIPES IT WILL DEFINITELY WILL HELP ME TO STAY ON THE RIGHT TRACK!, THANKS – KELLY. Thank you, Kelly, for requesting that I make a low carb cloverleaf roll. OMG best Keto bread to date.Cant stop eating them. Thank you very much for the recipe. OMG! I just made these. They are SO tasty. Thank you! My family loves them too. I’m not following keto but I want to try these anyway! I’ll even have cheese for this occasion 🙂 They look amazing!!! Oh these are so FUN – my girls would flip out love this! Thanks! These rolls are so perfect! Love that they can go with holiday meals that will be coming up soon. So yummy with any dinner too, especially for dipping in soups, stews and chili. mmmm!!! Fat=head rolls, sign me up!!! These look too darn good!